I am so psyched that Cesar Milan is coming to Boson. Thanks for the info! 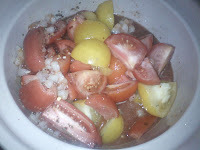 Since I just blogged about how I'm now eating tomatoes, I loved today's photo!